This pie crust is flaky, tender, easy-to-handle, and whole wheat! White whole wheat gives you all the health benefits of traditional whole wheat, with a milder taste. 21 mins. to 28 mins. 60 mins. to 1 hrs 13 mins. To make the crust: Whisk together the flour, buttermilk powder, sugar, salt and baking powder in a medium bowl. Add the butter to the flour mixture, and work it in roughly with your fingers, a pastry cutter, or a mixer. Don't be too thorough; the mixture should be very uneven, with big chunks of butter in among the smaller ones. Sprinkle the orange juice over the dough and toss to moisten. Add ice water a tablespoon at a time, mixing until the dough is nearly cohesive. If you grab a handful, some of it will hold together, but some will crumble away. 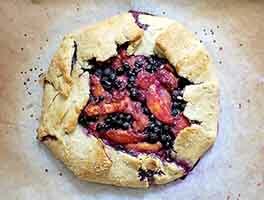 Using the parchment or waxed paper, fold the dough over on itself — first from one side, then from the other. You'll find that the dry crumbs are becoming incorporated with the cohesive dough. If there are still dry areas, spritz them with additional water, and fold the dough in on itself again. Keep folding and gathering until just a few dry crumbs remain unincorporated; this should only take a few folds. Shape the dough into a disk about 1" thick, and refrigerate it for 30 minutes or longer; this rest period allows the flour to absorb the water, making the dough easier to roll out. When you're "ready to roll," remove the dough from the fridge. If the dough has been refrigerated longer than 30 minutes, let it rest at room temperature for 10 to 15 minutes before rolling, to allow the butter to soften up a bit. Roll the dough to the size needed (about 12" to 13" for a 9" pie). Place it in a pie pan, and refrigerate it while you prepare your filling. Fill and bake as directed in your recipe. Yield: one crust for a single-crust pie. We like using orange juice with whole wheat, as it tempers the wheat's potential strong flavor, while not adding any orange flavor of its own. However, feel free to substitute water for the orange juice, if desired. This worked wonderfully! It didn't shrink when I blind-baked it and it looks so nice with the quiche in it. As long as it tastes decent, this will be my go-to savory crust. This was an incredible pie crust , I didn't have the orange juice and the buttermilk powder and I loved the taste of it. Made my first pie ever and it was to die for. I am now officially a pie baker so easy and you guys are so helpful. Love this product and the chat people..
As I sit here eating a slice of turkey pot pie I thought I'd write a review. My husband of 25+ years does not eat crusts which he calls "rinds". Not on pizza, pie, or a grilled cheese sandwich. I bake from scratch, real scratch aka I grind my own wheat. Finding an edible whole wheat pie crust that is flaky, easy, tasty, and works with fresh ground flour had proved impossible until this recipe. I think the acid in the OJ must help soften the wheat (my guess). But by far the best thing to come out of this recipe is my husbands reaction. He eats the crust....actually picks it off before the pie is served (working on THAT now). Thank you for a very successful recipe. 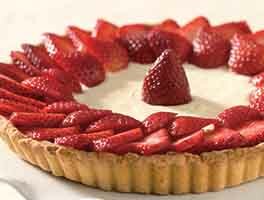 For a baked crust for example a strawberry pie, what temp and how long? Not sure if there is a variable with whole wheat flour. I've been fudging it but would like to do correctly from KAF.Thanks! We are trying to go with whole grains as much as possible, so this was the perfect recipe for our strawberry, rhubarb pie. I doubled the recipe so there was plenty for our 9 inch, deep dish, pie tin (whereas a typical double crust recipe comes up short). Even though I added too much liquid (or so it seemed), the dough was easy to roll out and it turned out delicious and flaky. Perfection! You guys are beyond great, thank you. Tastes good. too hard to roll without breaking. Dough is very fragile. This is an awesome recipe! I didn't include the powdered sugar as I don't like crusts sweet, and I used only butter. It was perfect as the crust for NYT's Straight-Up Rhubarb pie by Amanda Hesser. My first time using whole wheat flour for a pie crust-- this recipe was flaky and delicious! Thanks for posting.